Operatic vocal group The Tenors comes to Queen Elizabeth Theatre on Friday 24th November 2017 as part of their Christmas Together Tour! The beloved trio will be performing holiday hits from their new album of the same name, delighting fans with festive harmonies and their unique mixture of classical and pop music! 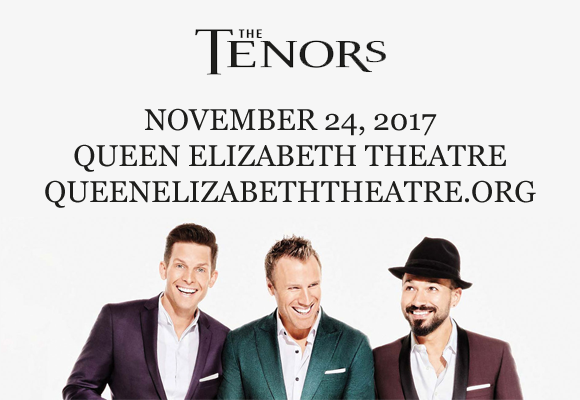 Hailing from Victoria, British Columbia, and originally known as “The Canadian Tenors”, The Tenors are an operatic pop vocal group consisting of Victor Micallef, Fraser Walters and Clifton Murray. The group started in 2004 and they released their platinum-selling self-titled debut The Canadian Tenors (Warner) one year later. The group's third studio album, 2012's Lead With Your Heart, also went platinum in Canada, and won the 2013 JUNO Award for Adult Contemporary Album of the Year. Their most recent album, Christmas Together, was released in October 2017.